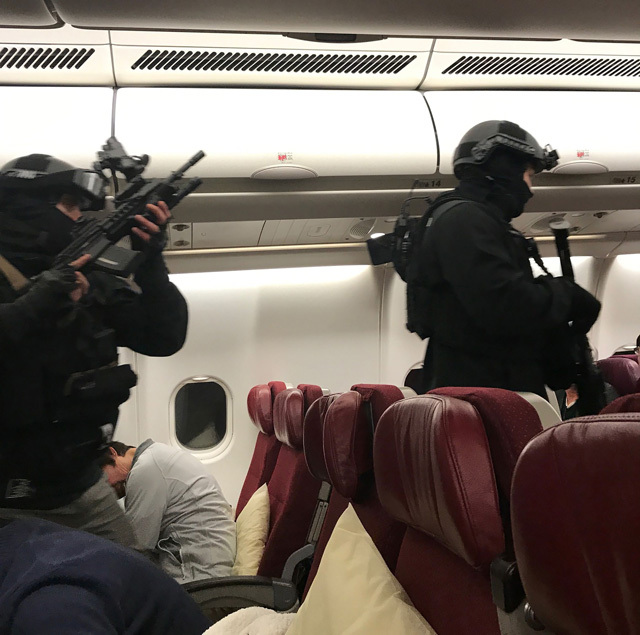 Armed police stormed a Malaysia Airlines flight which was forced to return to Melbourne after a passenger tried to enter the cockpit claiming he had a bomb, officials said Thursday. 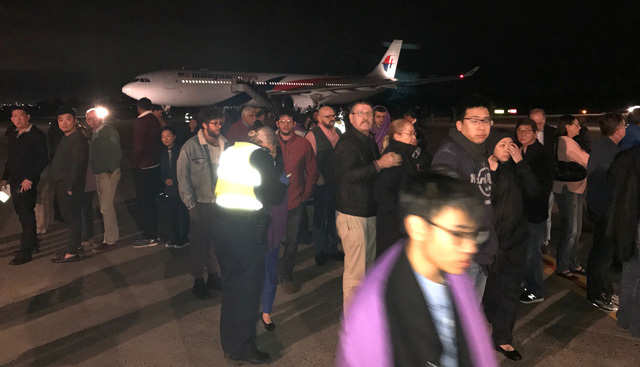 Passengers told of fearing for their lives, but Malaysian Deputy Transport Minister Abdul Aziz Kaprawi said a Sri Lankan national, who appeared to have been drunk, was overpowered by the plane's crew and later arrested. "It is not a hijack. One disruptive passenger tried to enter the plane's cockpit," he told AFP. "The passenger... claimed to have a bomb. But it was not a bomb but a powerbank," Aziz said. "Everyone on board is safe... He was taken out of the plane handcuffed by Australian security officers." "It is alleged that a man tried to enter the cockpit and threatened the safety of passengers and staff," Victoria state police said in a statement, but added that he "did not gain entry to the cockpit" and was subdued. "We do not believe this is terrorist-related at the moment," Langdon said on ABC News. 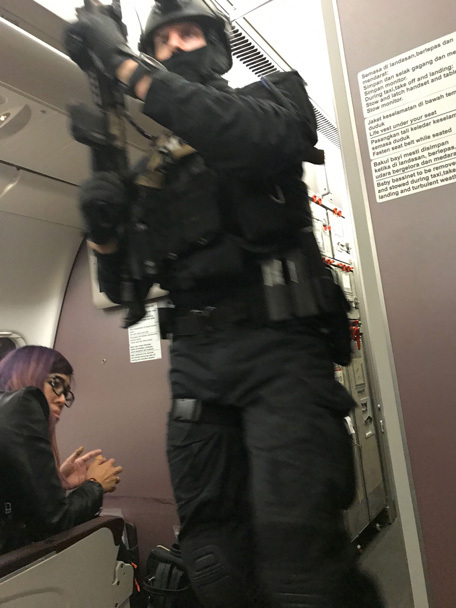 Photographs on the Australian Broadcasting Corporation website showed black-clad officers armed with rifles on board the plane. While officials tried to play down the incident, passengers told of some 90 minutes of onboard drama and fear after take-off. A business class passenger, who identified himself as Andy, told Melbourne radio station 3AW that the arrested man had threatened to "blow the plane up". "The staff were saying 'Sit back down sir, sit back down sir'. He goes 'No, I'm not going to sit back down, I'm going to blow the plane up'," Andy told 3AW. Andy said the man ran to the back of the plane, where two other men grabbed and disarmed him of a "giant black thing" and "put hog ties on him". Superintendent Langdon described the experience for passengers as "very traumatic", adding passengers and crew were "heroic". Passenger Arif Chaudery said he joined several others to subdue the man. "Families, kids, they were very scared, and some screaming... so three or four guys, we jumped as quickly as possible," he told Channel Nine. "We just put him on the floor and finally staff brought the belt, so we handcuffed him and tied his legs and put his face on the floor." Laura, who asked for her surname to be withheld, told the ABC she feared for her life. "I thought the plane was going to go down, I thought the bomb was going to go off, I really did think I was going to die," she said. Malaysia Airlines said the plane's passengers would be put up at hotels and offered another flight. The incident came just months after Canberra called off the search for missing flight MH370 carrying 239 passengers and crew, after a vast underwater hunt off Australia's west coast failed to find the plane. MH370 disappeared in March 2014, while another passenger jet, MH17, was shot down in July of the same year while flying over Ukraine in twin tragedies to hit Malaysia's national carrier.